This may sound cheesy or over-dramatic, but, as I sat, last night, thinking about what it means to be a world champion, my entire life went running through my head, all in the context of the Phillies and what they have meant to me since I was old enough to remember. Times have changed, friends have come and gone, my interests have ebbed and flowed, but there was always one thing in the background–one theme to every aspect of my life–and that was an undying devotion to the Philadelphia Phillies. From the joy of Kim Batiste to the devastation of Joe Carter. From finishing my spelling homework so I could watch the first 4 innings before bedtime to biking 70 miles for internet while in a completely undeveloped part of West Africa, just to check the Phillies scores to see if they could finish above .500. At every point, every milestone, every growing pain or heartbreak, at every triumph or failure, the Phillies were right there with me, whether I chose to recognize it or not. It was a parallel existence, similar to the human development I went through as a person. They were ever striving to “make it” as a baseball team, just as I was ever striving to “make it” as a person. There is enough innocence in baseball, just as there is in youth, to make you believe, regardless of where The Sporting News experts picked your team to finish. It kept you going, kept you believing that one day, one year, just one moment in your life, you can watch your beloved team–which is as much a part of you as anything on earth–collapse in a heap of youthful exuberance and joy. You could fall to the floor yourself and feel utter triumph, without ever throwing a pitch or swinging a bat. That regardless of whether you aged 7, 17, 27, or 67, you were immediately tranformed to a euphoric, youthful bliss, ensconced in a real, true, genuine feeling of accompishment, success and complete and utter pride. There is something to be learned about life through sport–and it is not simply the obvious lessons of the benefits of dedication and hard work or belief in a dream or practice or teamwork–there is a greater lesson. One that, because of its simplicity and universality, trandscends philosophical eloquence. It is simply the notion that life is there to be experienced. That life is there to be lived. I (and many others who know exactly how I feel right now) lived with the Phillies, every summer of our lives, no matter how many games out of first place they might have been. In the end, the games did not matter. What mattered was the fact that you believed IN the games—just as you believe in yourself. That you would love this team, these guys, these colors, this notion of togetherness with thousands and thousands of people you have never met, no matter what the circumstances. And, that you would love yourself no matter how many “errors” you make or how many “runners in scoring position you may leave” during your own personal challenges and struggles. What matters is that from the losing came strength, and from the winning came clarity. Each and every hour that I have invested in this silly sport played by people I will never meet has been worthwhile–not because I can puff out my chest and say that my team is the world’s champion, but simply because the fact that we are world champions has brought me to this ultimate realization–a realization that this “silly” game is more than just a sport. It is more than just a game. It is a part of my soul, a part of my existence. It is a big part of what makes me me. And, in the end, I wouldn’t have it any other way. So, thank you, 2008 Philadelphia Phillies, and all who are involved, but it must be understood that this title, this feeling, this realization is for so many more than the 25 players on this year’s roster. It’s for past champions like Mike Schmidt, Steve Carlton, and Tug McGraw. Pete Rose and Bob Boone. It’s for Greg “The Bull” Luzinski, Lonnie Smith, Del Unser, Larry Christenson, and Marty Bystrom. It’s Hall-of-Famers, like Joe Morgan, Tony Perez, and Chuck Klein. But, it’s also for guys like Steve Jeltz, Luis Aguayo, and the one and only Kevin Stocker. It’s for good guys like Jim Thome and Mickey Morandini. It’s for good ‘fros like the ones of Manny Trillo, Bake McBride, and Garry Maddox. It is for those that transcend generations, like Richie “Whitey” Ashburn, Robin Roberts, and Grover Cleveland Alexander. It is for Kentucky Senator Jim Bunning and his Father’s Day perfect game. It’s for every 50-something Philadelphian’s favorite all-time Phillie, Johnny Callison. It is very, very much for John Vukovich, but it’s also for Tony Taylor. It’s for Jim Fregosi, Dallas Green, and “The Pope” Paul Owens. It’s for Larry Bowa, the manager. But, it’s much more for Larry Bowa, the player. It is for John Felske, the manager and Lee Thomas, the GM. It’s for Daulton, Dykstra, and Duncan. It’s for Terry Mulholland, Tommy Greene, and even “Big Ben” Rivera. It’s for Ricky Jordan, Wes Chamberlain, and Pete Incaviglia. It’s for Roger Mason and the best eighth inning ever pitched. And, it’s most definitely for Mitch “The Wild Thing” Williams, despite the worst ninth inning ever pitched. It’s most certainly for John Kruk, and undoubtably for Aaron Rowand. It is NOT for Scott Rolen, J.D. Drew, Billy Wagner, Kenny Lofton, or even Curt Schilling. It’s NOT for cheaters like Jeremy Giambi, Ryan Franklin, or Jason Grimsley. But, it is for role players, like Greg Gross, Milt Thompson, Rex Hudler, Jim Eisenreich, and the great Charlie Hayes. It’s for utility players, like Randy Ready, Greg Legg, Kevin Sefcik, Kevin Jordan, Abraham Nunez, the great Placido Polanco, and the one and only Tomas Perez. It’s for backup catchers like Todd Pratt, Tom Prince, Steve Lake, Kelly Stinnett, Bobby Estelella, Gary Bennett, Johnny Estrada, and A.J. Hinch. It’s for good relievers like Steve “Bed-Rock” Bedrosian, Kent Tukulve, and Roger McDowell. It’s for bad relievers like Aaron Fultz, Todd Frohwirth, Jeff Parrett, Joe Boever, Wally Ritchie, Jeff Juden, Paul Quantrill, Mike Grace, Cliff Pollitte, and Yorkis Perez. It’s for insane relievers like Larry Andersen, Ricky Bottalico, and Turk Wendell. It’s for insane starters like Danny Jackson and Vincente Padilla. It’s for Philly’s own, the late, great “Johnny Marz,” John Marzano. It’s for the starting middle infield combination of Mark Lewis and Alex Arias. It’s for all the guys who came well after their primes, like Lance Parrish, Gregg Jefferies, Tommy Herr, Phil Bradley, Benito Santiago, “El Sid” Fernandez, Jerry Koosman, Bobby Thigpen, Jose Mesa, Ron Gant, Wally Backman, and Fernando Valenzuela. It’s for all the guys who were traded away before their primes, like Ryne Sandberg, Dave Stewart, Julio Franco, Mike Williams, Carlos Silva, and Gavin Floyd. It’s for all the guys who were supposed to, but never really had a prime, like Travis Lee, Rick Schu, Desi Relaford, Jeff Stone, Kevin Gross, Keith Hughes, Kyle Abbott, Tony Longmire, Tyler Green, first-round pick Wayne Gomes, and the infamous Jeff Jackson. It’s for all the guys whose primes actually did take place in our town, though unfortunately too often over-looked, like Bobby Abreu, Von Hayes, Juan Samuel, John Denny, and Mike Lieberthal. And, it’s even for all the guys who never actually played any baseball–prime or no prime–during their time here, like Danny Tartabull and Freddy Garcia. This is for Don Carmen, Shane Rawley, Andy Ashby, Dave Palmer, David Coggin, Brad Brink, Ken Howell, and Pat Combs. It’s for Robinson Tejeda and Eude Brito. It’s for Jon Lieber, Eric Milton, Kyle Lohse, Garrett Stephenson, and the late Cory Lidle. It’s for Michael Mimbs’ change-up and Darrell Akerfelds’ knuckle-curve. Though it may be more for Sal Fasano, there’s also a little bit there for Rod Barajas. It’s for Michael Bourne, Geoff Geary, and Mike Costanzo. It’s most certainly for Ed Wade–thanks for giving us Lidge, Ed. It’s for Marlon Anderson and Marlon Byrd. It’s for the so-called “speed demons” like Sil Campusano, Ricky Otero, Nick Punto, Lou Collier, Michael Tucker, and “White Lightning” Bob Dernier. It’s for Pirates’ manager, John Russell, Brewers’ interim manager, Dale Sveum, Angels’ bench coach, Ron Roenicke, and even the evil Rays’ third base coach, Tom Foley. It is for Juan and David Bell, and Ivan and Jose DeJesus. It’s for Glenn Wilson’s arm, Kim Batiste’s hit, and Ron Jones’ perpetually broken leg. It’s for the apparent five tools of Chris James and Wendell Magee, Jr. and the promise of Dennis Cook and Mike Jackson (twice). It’s for shaky relief pitcher, Eric Junge, but not shaky ESPN analyst, Eric Young. It’s for Brewers’ pitching coach, Mike Maddux, but not his brother, Greg. It’s for the hefty Brian R. Hunter, but not the sleek Brian L. Hunter. It is for Carmelo Martinez, but not his cousin, Edgar. It’s for Mark Leiter, but not Al Leiter. It’s for guys that you are proud to have represent you, like Andy Van Slyke, Dale Murphy, Rico Brogna, Dickie Thon, Doug Glanville, and Jeff Conine. And, guys who you may not so proud to have represent you, like Ugueth Urbina and Jason Michaels. It’s even for current Mets, like Endy Chavez, and former Braves, like Bruce Chen, Randall Simon, and Kevin Millwood.It’s for Gary Varsho and Gary Redus, David Delluci, Midre Cummings, Doug Bair, Bo Diaz, Kent Bottenfield, Charles Hudson, Bob Ayrault, Joe Millette, Tim Mauser, Ozzie Virgil, Chris Roberson, Kevin Elster, Floyd Youmans, Tyler Houston, Jeff Manto, Sixto Lezcano, Torey Lovullo, Amaury Telemaco, Nelson Figureoa, Kevin Foster, Ron Reed, Mike Easler, Gene Schall, Dave Rucker, Tom Hume, Terry Adams, Jim Lindeman, John Mabry, Joe Cowley, Russell Branyan, Wes Helms, Chad Ogea, and Tadahitoooooooooo Iguchi. But, most of all, it’s for all the people that make the lives of each and every Phillies Phan so wonderful, be they a part of the Phillies, in title, or the much, much larger part of the Phillies–the part that is the fans. Guys, this one’s for US!!!!!!! There was supposed to be the crowning of a champion on Monday night in Philly, but it turned into a monsoon and one of the strangest turn of events you’ll ever see in a sporting event. Game 5 of the World Series has been suspended and will be resumed…when? Nobody knows for sure. Now, there will obviously be a ton of discussion today concerning how the situation was handled by the umpires and Bud Selig. That’s a debate that could go on endlessly and not really get anywhere. Should the game have been called a half-inning or full inning earlier? Probably. Did the Phillies get the short-end of the stick by having to pitch and play defense in that top of the 6th inning? Maybe. People will claim that the league wanted the game to be tied or that there was some other conspiracy involved. That’s nonsense. The bottom line is this: the situation is over and it’s not going to be changed. The run that the Rays scored in the 6th is not going to be taken off the scoreboard. It wasn’t ideal for Cole Hamels to have to pitch in those conditions, but the Rays were hitting and running in the same conditions. Again, which team did that hurt more? Probably the team that is pitching and trying to play defense, but now is not the time to start whining and looking for excuses. These kinds of things happen in baseball all the time, not in the World Series, but they happen. It’s all part of the game. Really, this game should have never been started last night, but as Selig made very clear in his “Don’t blame me!” press conference, there was agreement from the Rays, the Phillies, and the umpires that the game should be played. So maybe group-think was the problem, maybe Selig should never have been put in charge of a laundromat, let alone a professional sports league, but if you’re going to point a finger to blame someone for how this turned out, you’ll have to do a whole lot of pointing. It’s all basically irrelevant now, so let’s just move on. If the rain ever stops. The game will pick-up in the bottom of the 6th, with a pinch-hitter for Cole Hamels. Expect to see Greg Dobbs in there facing Grant Balfour. When Utley comes up, we’ll probably see David Price into the game. I guess it could be J.P. Howell or Trever Miller, but with the game tied, I think Maddon will go to Price with the idea of leaving him in there for maybe the rest of the game, unless there’s extra innings. The next Phillie pitcher will obviously depend on whether or not they score in the 6th. If they don’t, it would probably be Chad Durbin or Scott Eyre, if they take the lead, it will be Ryan Madson or J.C. Romero. The ideal situation right now is for the game to be canceled tonight and finished on Wednesday night. Since Hamels only threw 75 pitches last night, you have to think he would be ready to start a potential Game 7 on three days rest on Friday. Of course, we all hope it doesn’t get to that point. As I sat and soaked in all of the post-game glory on Comcast Sportsnet and Fox last night, I suddenly had a sobering thought: this series isn’t over yet! Now, I don’t want to be the wet blanket thrown on everyone’s celebratory mood, but there will be plenty of time for rejoicing and celebrating after the final out of the series is recorded, hopefully some time around 11:45 tonight. The TV commentators and newsmen out at the bars refused to acknowledge that the Phillies could still lose. With a 10-2 Game 3 rout, a 3-1 series lead, and Cole Hamels taking the mound at home in Game 5, it’s not hard to understand some pre-mature celebrating. I was doing it too, but the fact of the matter is that crazier things have happened. Yes, Hamels has been unbeatable in the post-season, and there’s no reason to think that will stop now. Ryan Howard and Jimmy Rollins have come out of their slumps in a big way. But, if the Rays can manage to pull out a win tonight, they’ll be heading home knowing that they won’t have to deal with Hamels again in the series. They’ll need two wins at home (where they had the best home record in baseball this season), and they’ll be going against a pitcher they beat in Game 2 and a 45-year-old that blew up in his only two road starts of this post-season. The Phillie players will have to forget about all those questions they got after the game last night, asking them to sum up what it feels like to be on the brink of a championship. It has to be all about Game 5 now. They can’t rest on their laurels assuming that Hamels will be unhittable. This is a time for team leaders to step up and get everyone focused on doing it just one more time. One more time, one more win, then, as Charlie said, “we’re going to make a grand parade”. Obviously, it was an ugly loss in Game 2. Between the abysmal situational hitting, the fielding miscues, a base-running blunder, and the two horrendous calls by home-plate umpire Kerwin Danley, the Phillies took a game that should have been a solid opportunity for a win, and turned it into a momentum-shifting mess. All in all though, the Phils got the split they needed in Tampa and now it’s a 5-game series and they have home-field advantage. There were encouraging signs last night. For one, Brett Myers pitched very well. He gave up four runs and lost, but there wasn’t one ball hit really hard off of him, and if it weren’t for the previously mentioned mistakes by Jayson Werth in right-field and by Danley, he may have given up one or two runs instead of four. Also, Ryan Howard had a couple hits and really tagged the double into deep center in the second. It looks like Game 3 tomorrow night could be rained out. The Phillies website says that the travel day between Games 5 and 6 would be eliminated, so the pitching rotations would probably not be affected. -I was going crazy with excitement as the starting line-ups were announced and the players came out on the field….then the Backstreet Boys appeared. Absolutely nothing kills your buzz like a 10-minute rendition of the National Anthem by the Backstreet Boys. -We’ve seen a couple teams in the past put the shift on Utley, but it doesn’t seem like a good idea. I’m sure the Rays have some scouting reports that say it’s a good move, but Utley is not Howard. He can spray it all over the field and that shift is libel to backfire if they keep doing it. 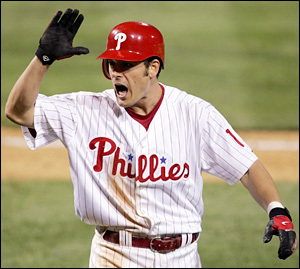 -When Utley hit the homer, I liked how the Phils bench stayed relatively calm. It looked like they came in with a business-like approach. Of course, it may have just seemed like they stayed calm compared to how I reacted. -Jimmy Rollins took the prize for worst at-bat of the night in the second inning. He comes up with the bases loaded and one out. Kazmir has walked three in 1 1/3 innings, including two of the previous three batters. Rollins takes ball one, then gets jammed for a shallow fly-out to center, resulting in Victorino getting thrown out at home to end the inning. Jimmy: Make the guy throw a strike!!! -B.J. Upton hit into two big double plays in the first three innings, including with the bases loaded in the third. Amazingly, he didn’t hustle down the line either time. He’s a fast guy, and he was nowhere near first when the Phils completed the 5-4-3 DP in the third. -What’s up with Japanese second-baseman against the Phils in the playoffs? Hamels couldn’t get Akinori Iwamura out last night, and it definitely brought back memories of Kaz Matsui last year. It was interesting how Hamels seemed to struggle more against the lefties last night, between Iwamura’s three hits and the Crawford homer. -It was a nerve-racking game, thanks to the continued inability of the offense to add on runs. A few weeks ago, Bry pointed out to me that Ryan Madson is suddenly throwing 97 mph, and it is crazy. For years, he basically threw a low-90’s fastball that was pretty straight, and he got guys out (some of the time) with the change-up and curveball. Now he’s not only throwing 96-97, but the ball is tailing back on to the right-handers hands, and he is looking VERY tough to hit. -Game 2 tonight. Hopefully Myers can keep Longoria and Upton off-balance, as Hamels did, and maybe Howard can get going off the righty James Shields. Okay, so Doogan will attest to the fact that I’m the first person to overreact to statements made by a sports figure, especially if there’s any way they could be construed to be a slight against one of my teams. And from what I’ve seen Scott Kazmir is a likeable guy, but well, this statement set me off yelling at the TV the other night, alone in my apartment. OK. I feel a little better now that someone actually heard me. A little. Well, here we are…the WORLD SERIES. What a year, what a year! I’m back from the two-week wedding/honeymoon extravaganza, and now I get Phillies World Series games to stress about…ugh. Well, I was rooting for the Rays because I thought that the Phils matched up better with Tampa than the Sox, but the old adage, “be careful what you wish for because you just might get it” is now on a loop in my brain. The Rays are immensely talented, and they seem simply too young to even be nervous. The way they blew Game 5 and then lost Game 6 at home with their ace on the mound, it looked like the moment was finally too big for these guys. But, then they go down 2 batters into Game 7, but Matt Garza dug in and Joe Maddon coached batter-by-batter only to call on a guy with 5 major league appearances to win a Game 7 and here we are–and I’m terrified. But, the Phils have looked phenomenal in this postseason, so I guess all 12 Rays fans are probably just as nervous as we are. 1). Get ’em early: No matter how “experienced” they may play, other than Dan Wheeler’s minor setup role for the Angels in ’02, not one Ray has ever played in a World Series game. They are led by 24-year olds like Upton and Kazmir and 23-year old Longoria. I think if the Phillies can jump on them early (either early in Game 1 or by taking Game 1), the pressure may actually mount a little in “Cinderella’s” dugout. (NOTE: the Phillies don’t exactly have extensive WS experience, either, as only Brad Lidge (3.2 IP), So Taguchi (15 ABs), Pedro Feliz (5 ABs), and Eric Bruntlett (2 Gs, 0 ABs) have even appeared in a WS game). 2). Manage “shortened” games: Madsen, Romero, and Lidge have been lights out all year, and especially in the postseason. Durbin is struggling, but still reliable. Scott Eyre is a solid left-hander. Uncle Charlie can manage 6-inning games. Get the lead after six and turn it over to these guys to come in a end it. What a luxury…I hope I didn’t jinx this. 3). Keep the line moving – trust the whole order: The whole Michael Jack Schmidt message, “keep the line moving,” has been adopted by this year’s Phillies team. Though they have clear “RBI guys,” the Phillies have to trust the whole lineup to produce. Utley and Howard have to be patient and pick their pitches to try and drive in runs. Taking walks, forcing high pitch counts, and trusting the Victorinos, Werths and Ruizs of the lineup win games may be the answers to solving this talented, but young Rays staff. 4). Keep them in the yard: One of the more underrated things about this team all year has been their power up and down the order. People talk about their pitching, defense, and speed, but they were 4th in the league in home runs. And that is with #2-hitter, B.J. Upton, only hitting 9 all year (he is now healthy and has 7 in the postseason alone), #3-hitter, Carlos Pena, with an incredibly slow start, #4-hitter, Evan Longoria, spending the first month of the season in the minors, and #5-hitter, Carl Crawford, missing almost 60 games due to injury. The Phillies pitchers have to keep these guys in the yard. 5). Get the Rays to chase: The one big flaw in the Rays deep lineup is that they do not draw many walks. 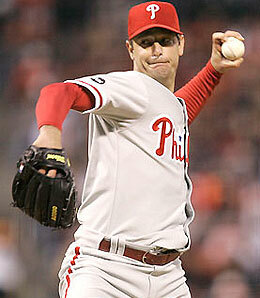 This is why I like Jamie Moyer against the Rays–he will get them to chase bad pitches. Hamels, Myers, and Blanton should do the same thing because they are prone to it. Furthermore, this team eats up fastballs, so the Cole Hamels change-up, the Brett Myers curveball, and the Brad Lidge slider may the difference in this series. 7). Pile on if up, Keep fighting if down: One of the major lessons from both League Championship Series is that no lead is safe, regardless of how good you think your bullpen is. As reference by Doogan, Chase Utley’s unassisted double-play kept the Dodges at 5 runs in the pivotal Game 4, allowing the Victorino/Stairs heroics to be game-winners. And, everyone knows what happened to Tampa with a 7-0 lead in the 7th inning–Papelbon put out a seemingly meaningless fire in the top of the 7th, the Red Sox got 4 in the bottom of the 7th, 2 more in the 8th, and 2 more in the 9th to win it. No lead is safe, so if the Phillies are up, they need to pile on the runs, and if they’re down, they need to keep it as manageable as possible because their offense is potent enough to make it up. Charlie Manuel hasn’t said much about who will be the designated hitter for the games in Tampa, so that leaves us to ponder the question. Bob Ford covered the issue in today’s Inquirer, and says that Charlie has ruled out the possibility of Ryan Howard DH’ing during the series. Against righties, I think it’s almost definite that Greg Dobbs will find his way into the line-up, either at third or as the DH. Geoff Jenkins and Matt Stairs are also pretty good options to DH if Dobbs plays third. The options against lefties are not nearly as good. The right-handed bats are basically just Eric Bruntlett and Chris Coste, who could be freed up to DH with the addition of catcher Lou Marson to the post-season roster. So Charlie will basically have three options for Game 1: play Bruntlett (.217 BA on the year) in left field and DH Burrell, DH Coste (.107 BA in September), or DH Dobbs (9 out of 226 AB’s this year vs. lefties). Luckily, one of the benefits of the ALCS going seven games is that the Rays’ only lefty starter, Scott Kazmir, will pitch Game 1. That means Game 1 will be the only game of the series where the Phillies will face a lefty with the DH, as Kazmir’s next start will be Game 5 in Philly. Charlie has said that they will stick with the same rotation they’ve used in the first two rounds: Hamels, Myers, Moyer, Blanton. That means Moyer will be in line to pitch Game 7, if necessary. Personally, I would have flipped Moyer and Blanton, so that Blanton would be there in Game 7, but Charlie is obviously looking at Moyer’s two postseason starts so far as aberrations. Right now, Moyer in Game 7 is a scary thought, but I’m ok with the decision. He’s had a great year, he pitched well over the last couple of months of the season, and, with all his experience, he’s capable of putting those bad starts behind him and pitching well in this series. If he blows up again in Game 3, options for Game 7 will have to be looked at, including pitching Blanton on three days rest. The Rays’ rookie phenom pitcher, David Price, may have taken over the closer’s role in Game 7 of the ALCS. Their bullpen has been strong all season, but Dan Wheeler as a closer isn’t really going to scare anyone. Price was the #1 pick in the draft last year and is looking like he was a good choice. He’s got a high-90’s fastball, great slider, and throws strikes. He’s the type of big, powerful left-hander that can make life very hard for hitters like Ryan Howard and Chase Utley. If he can be a shut-down closer, and guys like Wheeler, J.P. Howell (2.22 ERA), and Grant Balfour (1.54 ERA) are setting him up, this Rays bullpen is outstanding. I was rooting for the Rays in Game 7, but as I watched Price work in the 8th and 9th, I saw one of the Rays few weaknesses possibly disappearing. Philadelphia Philles: 2008 National League Champions. It’s a beautiful thing. As I watched the fairly easy Game 5 win, I was obviously excited, but I wasn’t completely appreciating the magnitude of this Phillie team’s accomplishment until my man Joe Buck started recounting the previous five Phillie teams to win the NL pennant. For life-long Phillie fans, they are years that stick in your brain: 1915, 1950, 1980, 1983, and 1993. The Whiz Kids, the Wheeze Kids, and the ’93 team that somehow never ended up with a nickname that stuck. It’s pretty amazing to think that the ’08 group has now matched the accomplishment of those teams, even if they’ve done it with slightly less memorable characters on the team. They’ll move on to the Fall Classic now, attempting to match the one Phillie team that stands alone above the rest: the 1980 Champs. The silver lining in playing for (and rooting for) a team with a history of failure, is that the few teams that find success are revered for entire generations. I was born two years after 1980, but I can name most of the 25 players on the championship roster. I couldn’t tell you a single thing about Bake McBride, other than the fact that he was an impressively afroed member of the ’80 Phils. As a kid, I watched guys like Lonnie Smith and Bob Walk with special interest, knowing that they too had been members of that team in ’80, even if they were young and didn’t contribute much. Every player on the ’08 Phillies now has the chance to be entered into Phillie lore, to be a member of the team’s pantheon, and be remembered by a generation of Philadelphians and Phillie fans that aren’t even born yet. That’s pretty cool. The post-game on-field interview with Jimmy Rollins also brought the win into perspective for me. As a fan, any time your team has some long-awaited success, it’s the guys that have been on the team the longest that make it that much more satisfying. Jimmy is the leader of the team, and my favorite Phillie, and it’s great to see him with a chance to play on the stage of the World Series playing for a championship, and doing it with the Phils. I’ve never been a huge Pat Burrell fan, but he’s grown on me this year, and it’s great that he’s here for this, after having been with the team so long. To back away from the nostalgia for a moment, it will be interesting to see what the Phillies do with the rotation once they get to Games 3 and 4 in the Series next weekend in Philly. My guess is that it will be Blanton in Game 3 and Moyer in Game 4, but they will have an option to consider: Is it time to take the kid gloves off of Hamels and send him out there on three days rest in Game 4? They’ve obviously refused to do that so far, but this is the World Series and he’s going to have six days off before his Game 1 start on Wednesday. This would really only make sense if they are willing to pitch him on three days rest again in Game 7. I don’t see it happening, but it’s a possibility, especially if they’re down in the series after 3 games. As for the ALCS, I’d still rather play the Rays than the Red Sox, but it would probably be good if the Sox win Game 5 on Thursday night. If nothing else, it would force the Rays to use James Shields (clearly their ace right now) on Saturday, making him unavailable for Game 1 of the Series, unless they throw him on three days rest. One last concern will be the six days off for the team before they play again. After a 7-2 tear through the first two rounds, they could lose some momentum with this long lay-off. The Rockies and Tigers had long breaks before the last two World Series, and they ended up looking flat. That may just be a coincidence, and there’s nothing that can be done about it, but it has to be a slight concern this week. The concerns won’t be too great though, the Phils are World Series-bound and maybe 10 years from now, young Phillie fans will be closely following J.A. Happ for no good reason. -Joe Buck and Tim McCarver criticized Charlie Manuel for walking Manny in the first inning, but it was the right move, as Manny showed later in the game. You just can’t get that guy out right now, and he should be avoided at every opportunity. Russell Martin and Andre Ethier are solid hitters, but they’re no reason to throw a strike to Manny with runners in scoring position. -Surprisingly, Buck and McCarver said something that I actually agreed with in the 6th inning when they said that Shane Victorino should not have been bunting with two on and no outs. Victorino is the hottest hitter in the line-up right now (and was even before the big homer in the 8th), so there’s no way he should be sacrificing and leaving it up to Pedro Feliz and Carlos Ruiz to get the runs in. I don’t know if that call came from Charlie or if Victorino did it on his own, but he needs to be swinging in those spots. -The key to the game was definitely the Phillies getting out of the bottom of the 6th with only two runs allowed. When it was second and third with nobody out, I was just hoping they could keep it to one more run given up in the inning, but thanks to an Ethier line-out, an intentional walk to Manny, and the incredible unassisted double-play by Utley, they escaped with only a two-run deficit and were still right in the game. By the way, Ryan Howard really needs to learn how to throw the ball this offseason. -I know Cory Wade had a great rookie season, but he looks hittable and it seemed like a matter of time before the Phils took advantage of him. And how about Matt Stairs coming in and clobbering that home run off of Jonathan Broxton, who had given up two home runs all year. I loved the interview with Stairs after the game. When players are asked about a home run, they always say the same things, like what Victorino said before Stairs, something like, “I was just looking to hit a line-drive and it happened to go out”. Stairs response was, “Yeah, I just did the same thing I’ve done my whole career, go up there and swing for the fences”. Awesome. -A final strategic note: I agreed with Charlie going to Lidge in the 8th. With Manny up and two out, it was the perfect situation. I know he didn’t get him out, but Sandy Koufax in his prime couldn’t get Manny out right now. It was still the right call. Kid Cole will take the ball tomorrow and hopefully the Phils will be cracking open the champagne bottles for the third time in the last few weeks. As for the ALCS, the Red Sox are down 2-1 and have Tim Wakefield going tonight, but they’re far from out of this. It still could go either way, and I’m still rooting for the Rays.